Since 2014, the OECD stressed the importance of “inclusive growth”, that implies improving living standards and sharing the benefits of increased prosperity more evenly across social groups. A recent paper by the OECD Regulatory Policy Committee, Promoting Inclusive Growth through Better Regulation: the Role of Regulatory Impact Assessment, analyses the use of RIA as a tool to promote the integration of issues of inclusive growth in the development of regulation. By reviewing country practices in four areas – namely impacts on specific social groups, impacts on gender equality, impacts on poverty and impacts on employment – the report shows that inclusive growth considerations are scarcely integrated into RIA, even when this is required by official RIA guidelines. Comparatively, distributional effects and gender impacts are more often assessed, whether specific impacts on disadvantaged groups, on poverty and unemployment tend to be underestimated, probably due to methodological problems. Moreover, when issues of relevance to inclusive growth are assessed, the approaches tend to vary considerably across countries. 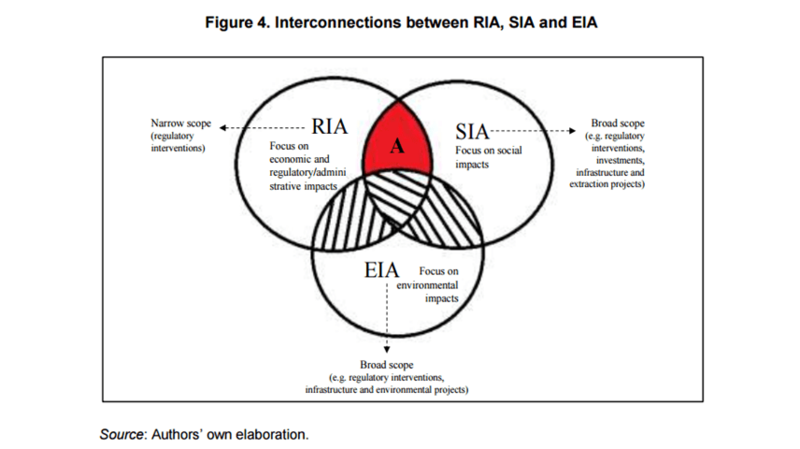 As this evidence could undermine the confidence in RIA as a tool to foster inclusive growth, the paper aim is to promote a reflection on an integrated impact assessment framework, which includes RIA, social impact assessment (SIA) and environmental impact assessment (EIA). In this perspective, beside providing interesting data on countries experiences, the paper rises many critical questions which are meant to nourish the debate on this topic in the context of the New Approaches to Economic Challenges (NAEC) initiative. The analysis presented by the Regulatory Policy Committee is integrated with a study by Rex Deighton-Smight, Using Regulatory Impact analysis to foster inclusive Growth. The aim of this paper is not only to explore – from a theoretical and critical point of view – the potential of RIA in fostering inclusive growth, but also to assist countries in establishing when and how RIA could successfully incorporate inclusive growth consideration.